Your Health System is Responsible for Your Patients’ Care. Don’t Put the Introduction in Someone Else's Hands. Over half of all consumers—and between 60-70% of those who've experienced a health issue—say they've looked online for information about health concerns or providers.1 In the race to attract them, many health systems have invested in listing providers on third party websites—at the expense of their own web presence. 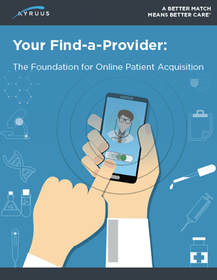 Investing in your find-a-provider brings traffic directly to your website, gives you more control over the patient journey, and facilitates brand differentiation essential for patient acquisition and retention. Plus, get our Find-a-Provider Must-Haves list. Download the paper today!